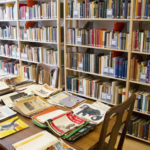 This valuable private library was acquired by the Carl Schlettwein Foundation in 1998, following the death of historian, theologian and Africa expert Hans Werner Debrunner (1923–1998). It is run as an independent, self-contained collection and consists of a library and an archive that are closely related thematically. The library comprises around 3,100 books and individual issues of journals focussing on West Africa, missionary history and the African diaspora. To a lesser extent, the library also contains works on countries in northern and eastern Africa as well as the southern part of the continent. Most titles were published in the first half or the middle of the 20th century. The archive documents Hans Werner Debrunner’s academic work. It comprises documents compiled by Debrunner during his many years conducting research on African history and ethnology, the history of European-African relations as well as missionary history and biographies of Swiss in Africa. Most of the archive has been catalogued in a finding aid that may be consulted on the premises.